Laney launched the latest expansion, this British amplifier manufacturer growing. 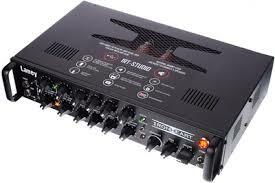 Iron Heart Studio IRT is a head amplifier for guitar with design concepts and tech tube rack. Applied technology was relatively new and modern. Because it comes with a USB connection feature audio I / O that can be connected directly to a PC / Mac (iPad / iPad mini). So for any recording needs can be directly executed. The appearance of amp weighs about 11 kg, facilitated a three channel (clean / rhythm / lead) and three types of 12AX7 preamp tubes and two EL84 tubes for the output type is clad in a black box with a flat material for aluminum and steel chassis construction. Also there is a pair of iron buffer with chrome iron material in the front so it makes it look sturdy and appealing. On the front panel, there are two input options (15W /> 1W), control knob like clean volume / pre-boost, gain rhythm / lead gain, EQ (bass, middle, treble with pull-push feature), dynamics, tone and reverb. Also comes with a choice of three switches (clean / pre-boost, clean / rhythm, lead) as well as the power button. While at the rear panel, feature products attached DI out, USB, phones, aux in (cd / mp3), fx loop (send-return), remote switch food, loud speaker output. Each switch comes to choice. As in the USB menu, there is a on / off switch emulation, where the menu can give real character sound results when connected to a computer. The advantages of this amp, any type of guitar used, active or passive, in this amp inputs can accommodate both full potential without reducing the capacity of the guitar being played. The resulting sound still distinctive character Laney Iron Heart. Sound clean, clear while containing dense and modern distortion. So it is very safe for all genres of music. Read also “Laney LC50-112 50W 1×12 Tube Guitar Combo Amp Review” and another gear reviews. Hopefully the article of Laney Ironheart IRT Studio Guitar Amplifier Head Review useful for you.